Laura Curry, who teaches a humanities course at the university, began to argue with campus police officers when they told her to watch her language. 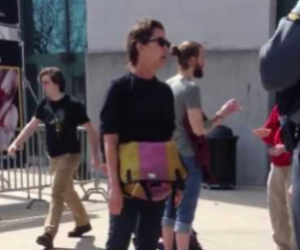 She was taking issue with a display by the campus group UB Students for Life, which demonstrated similarities between human rights abuses throughout history, such as slavery and racism, with the murder of unborn children. When officers again advised that she needed to refrain from using profanity, she became even angrier. She then continued to argue that it was her right to loudly yell curse words in front of everyone in the vicinity. The professor then called out to an individual nearby to alert her 1:00 class that she would not be teaching that day as she had been arrested. Officials at SUNY Buffalo have confirmed that Curry is now facing criminal charges. Those who have viewed video footage of the incident have agreed that the professor’s tirade was inappropriate. The Creative Minority Report advises that abortion supporters have lashed out at pro-life students on campus in years past. In 2011, angry individuals flung feces at the signs. Warning: Video contains profane language.